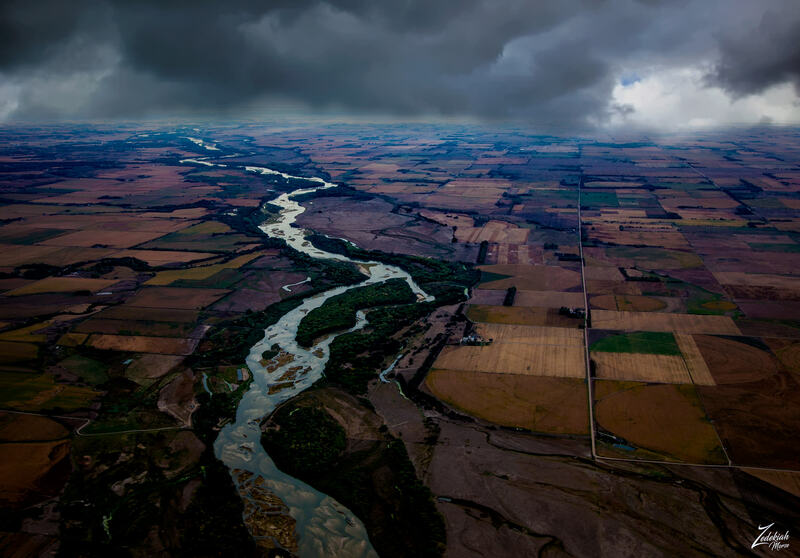 This is the North Loup River, a tributary of the Platte River, which runs for approximately 68 miles (109 km). The name of the river means “wolf” in French, and was named by early French trappers in association with the First Nations Skidi band of the Pawnee tribe, whose name means “Wolf People,” and who lived along the rivers banks. The Loup River and its tributaries, including the North Loup, Middle Loup, and South Loup, are known colloquially as “The Loups”. Nebraska lays pretty much in the very middle of the United State straddling both the Great Plains and the Midwestern United States.Nebraska’s name is derived from the transliteration of the archaic First Nations Otoe words Ñí Brásge, pronounced [ɲĩbɾasꜜkɛ] (contemporary Otoe: Ñí Bráhge), or the First Nations Omaha Ní Btháska, pronounced [nĩbɫᶞasꜜka], meaning “flat water“, after the Platte River that flows through the state.